Kingsholm once again welcomed the Rugby for Heroes / Ideal Boilers Hybrid Cup sides to a very warm and sunny Gloucester on the 30th of March. 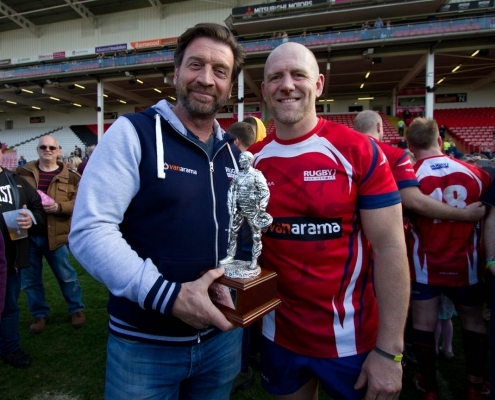 Having been played in Hull the year before (and another win for the League side), it was great to be back in front of the Kingsholm crowd who were excited to see the Union legends, captained as always by Rugby for Heroes Patron Mike Tindall MBE, and the Rugby League side captained by GB legend Keith Senior. As the crowds streamed in, the players took to the new 4G pitch to warm up and shake off the cobwebs. We were delighted to be joined by so many legends of both codes for what would prove to be a fantastic game showcasing the ‘old skills’ of many of the players. As one of the players commented to me at half time, ‘the mind still thinks I can run and catch, but no one told my body’! The first half was played under Rugby League rules, something that had been agreed at the gala dinner the night before, with Mike Tindall stating to Keith Senior that he had ‘flipped a coin to himself earlier… in private….won and chose League rules first….! !’ The mind games had begun! Despite a general inability to run backwards by the Union players, they managed to pull out of the bag a couple of outstanding early tries from former Scotland international Sean Lamont that gave them the edge over the stunned League heroes. The League team managed to pull a try back through Rob Kerman but by half time the Union players were 22 – 8 up, with the second half reverting to their more familiar rules (and rucks and scrums and line outs!) the Union team headed to the changing rooms in good spirits. As both teams relaxed into the game, the silky skills from everyone came through and the crowds were enjoying an exceptional showcase of talent. The players threw themselves fully into the game and it was clear there was no holding back as the tackles streamed in. Another try for both sides from Benji Lloyd and Rob Cook concluded the game and for the first time in the 3 years, the Rugby Union team lifted the Ideal Boilers Hybrid Cup with a winning score of 48 – 34. The trophy was presented to Mike by his wife, Zara Tindall MBE as both teams came together to thank the crowds and the organisers. Another wonderful family day of rugby organised by Rugby for Heroes, the charity that supports military personnel through their journey into civilian life. For 2020 the Ideal Boilers Hybrid Cup returns to the KC Stadium in Hull. 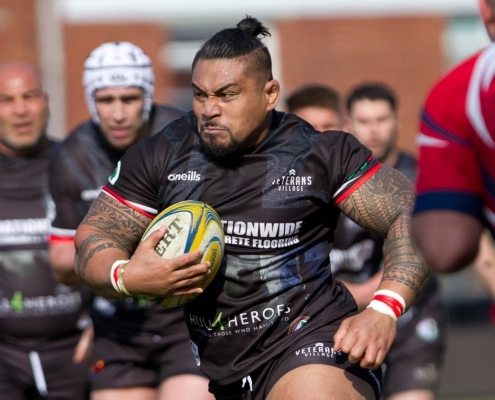 Please keep an eye on the website (rugbyforheroes.org.uk) for more information and other upcoming events.